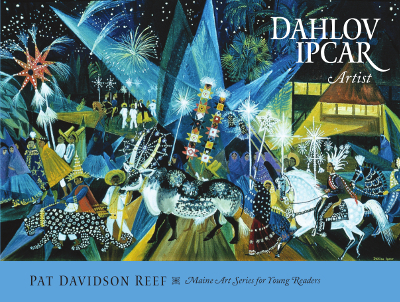 This book is a juvenile biography for young people about Maine artist Dahlov Ipcar, who has a distinctive style. It explores visually her growth as an artist from selected childhood works to her adult masterpieces in museums. Also included in the book are examples of murals in public buildings, illustrations in children’s books, and wonderful cloth sculptures that Dahlov has created. It is designed for both children and adults to enjoy. to senior citizens in the Osher Lifelong Learning Institute (OLLI). Her greatest loves are teaching and writing. She is a former member of the Maine State Arts Commission and a current member of both the Portland Museum of Art and the Friends of the Colby College Museum of Art. Sharing a love of art is an important part of her life.